I’m getting a head start on this weekend’s celebration while there’s time. Thank you for following my blog and your support throughout 2016. I’m excited about 2017. Aren’t you? Perhaps the new year will bring happiness and satisfaction in your life. This is my New Year’s wish for everyone. 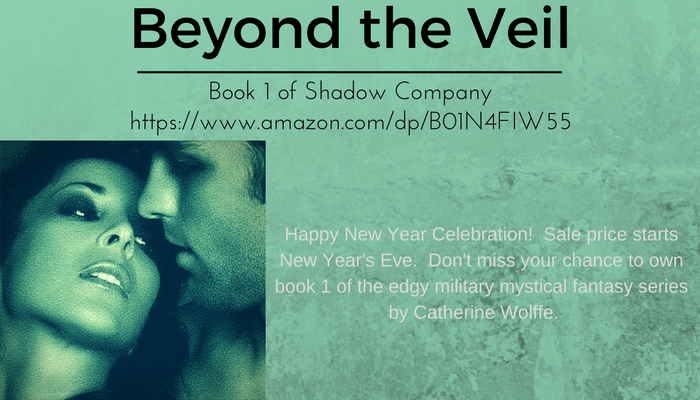 My celebration begins with a price reduction for Beyond the Veil, Book 1 of Shadow Company. Keep an eye out at Smashwords.com and Amazon.com for the switch during the end and beginning of 2016-2017. Now, for that Tuesday Teaser. Testy is the word of the day. Have you ever had one of those encounters that curled your toes but when things settled again, the vibe went haywire? Aubrie and Logan finally have a real date under the stars and sparks fly. The next morning doesn’t find them on the same page, though. Here’s an excerpt for your pleasure. “You sure are cheery this morning.” She glanced at him with the last of her observation fresh out of her mouth. “I mean, where do you get such energy? Me, I’m not a morning person.” Probably best to dive into the coffee in her hand, she mused. “It’s a gorgeous day. I’m feeling better. You worked some kind of miracle on me last night. Besides, I don’t usually have a date for breakfast.” He cut her a cautious glance. “I know, drop ‘em off and leave. Right?” The laugh came out brittle. Okay, testy woman. Drill it back a notch her brain shouted. Aubrie shoved at her hair. “Look, I’m gonna apologize to get it out of the way. I guess it was the high altitude, but I don’t usually sleep with a guy on the first date. That was a date, right?” With brows furrowed, she glanced at him again. This time, irritation surfaced briefly. The lines around his mouth hardened. “Now, don’t get me wrong. I enjoyed myself. I’m off kilter here is all.” The stiff grin probably spoke volumes. Doing more damage than good, Aubrie. Stop while you’re ahead, her mind growled. “No, that was me,” he mumbled. “What?” Aubrie came back, dusting her hands on her dress. “I said that was me staring at the stars. Can’t quite figure out how you managed to seduce me. I got to give it to you. You were something. Isn’t this heaven?” Sarcasm seeped through his question.